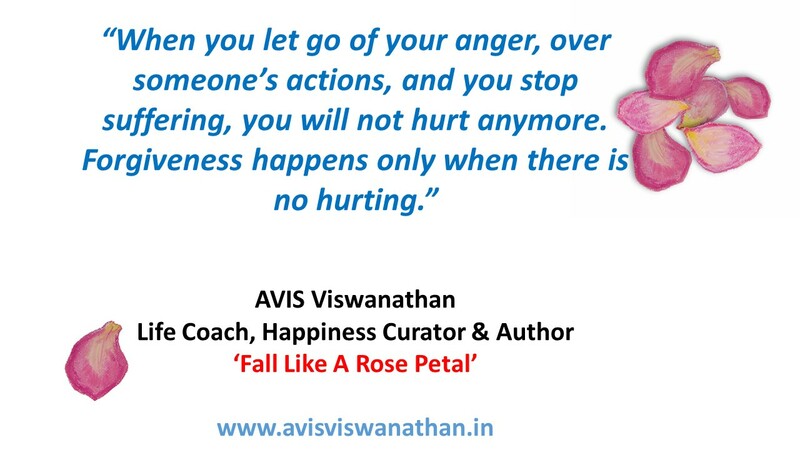 Author AVIS ViswanathanPosted on April 2, 2019 April 2, 2019 Format ImageCategories Art of Living, Forgiveness, Happiness, Inner Peace, Intelligent Living, Life, Spirituality, UncategorizedTags Anger, Art of Living, AVIS on Happyness, AVIS Viswanathan, Fall Like A Rose Petal, Forgive, Forgive and Forget, Forgive Even If You Can't Forget, Forgiveness, Happiness, hurt, Inner Peace, Inspiring Happiness, Inspiring Happyness, Intelligent Living, Let Go, Life, Life Coach, Life Coaching, Life Lessons, Life Quotes, Move On, Pain, Revenge, Spirituality, Suffering, the happynesswalaLeave a comment on Liberate yourself – forgive! Forgive and walk away happy! When you forgive someone, you are freeing yourself. A lady told me the other day that she is finding it very difficult to forgive her husband for having an affair with another woman. She and her husband are going through a separation. “But I can’t get down to forgiving him. I am unable to move on,” she confessed. She wanted to know if there was a way to forgive. I told her that forgiveness is the only way to move on. But let us first understand that people do things we dislike to us, stuff we don’t want done to us, like causing us hurt and grief, only because they don’t see themselves as doing anything wrong. So, in this lady’s case, it is possible that her husband saw nothing wrong in his relating better with someone else and being drawn to her. Now, with the lady clinging on to the hurt, while her husband has moved on, is what is causing her suffering – unnecessarily. And she will suffer until such time that she forgives her husband and moves on. This perspective applies in all contexts to all of us. Simply, there is no point in grieving over others’ behavior. Because you have no control over them. What you can control is how you respond. Therefore, forgiveness needs to, and must be, cultivated. This does not mean you give up your stand or stop being firm in a situation. Fight the issue, fight the good fight, be dogged about what you believe is right, including the way you want to be treated, but forgive the person. The practice of forgiveness involves training your mind using three steps: 1. Give the situation love. Send peaceful thoughts and energy to that person. This may be initially difficult, because the very thought of that person may make you feel angry. But keep at it. Keep saying, “May everything that this person wants to achieve in Life, and with me, be possible and may there always be light, happiness and peace in this person’s Life”. 2. Find ways to communicate to the person what your stand or views on the issue you are fighting over are. Avoid getting even. Stick to the point. Text messaging or sending a simple email are good options for such a purpose. Remember a physical interface can only aggravate and lead to a verbal duel. 3. Work hard on not revisiting that hurt. Immerse yourself in what gives you joy. Music, children, work, nature…whatever; keep reminding your mind that you don’t want to think about the hurt. When you forgive someone, you are freeing yourself of all the emotional burden you would otherwise be unnecessarily carrying! Holding on to a resentful episode at a personal level means you are continuing to hurt. This will only chew you up, keep you unhappy and make you suffer. When you walk away, with forgiveness in your heart, from a hurtful, resentful situation, you are walking away happy. Doesn’t that matter the most? Author AVIS ViswanathanPosted on March 18, 2017 Categories Forgiveness, Inner Peace, Intelligent Living, Life, Spirituality, UncategorizedTags Art of Living, AVIS Viswanathan, Fall Like A Rose Petal, Happiness, Inner Peace, Intelligent Living, Let Go, Non-Suffering, Spirituality, SufferingLeave a comment on Forgive and walk away happy! Forgiving someone for a transgression and yet being firm on the issue need not be mutually exclusive. A young manager I know is in a quandary. His boss has been harassing him at work – to the extent that the young man went into depression. His colleagues advised him to report the boss’ behavior and to seek a new role within the organization. The manager got himself assigned to a new project within the company over some months but he has chosen not to complain about his ex-boss. Over coffee the other day he asked me if was right or wrong in a. forgiving his boss and moving on and b. not reporting his boss’ behavior to his company’s HR leadership on grounds of breaching an organizational value – ‘respect for the individual’. “I am not sure I can be forgiving and also report him,” he confessed. As I have learnt from Life, you can – and often must – do both. There’s a warm and compassionate side to each of us. We are, by nature, willing to forgive people for their transgressions. But often times our softer side is viewed and interpreted as our weakness by people who trample upon our emotions or deny us our freedom or even basic, fundamental, human courtesies. In such situations, it is absolutely fine to stand up for yourself, look the someone who is bullying or harassing you in the eye, and say that you will not take this treatment anymore. Besides, in this particular manager’s story, it is important that his boss’ behavior is reported. Because it conflicts with an organizational value and if left unchecked it may cause serious emotional injury to other employees and also impair the organization’s culture. Important, when you are forgiving someone, you are gifting yourself freedom from the trauma that following any pain that has been inflicted on you. Forgiveness frees you of suffering. But fighting for the injustice meted out to you in the first place, that’s issue-based. So if you choose to stay firm, and unrelenting, on not allowing such an issue to arise again, either to you, or to anyone in the future, there is no conflict whatsoever. In essence, while to make a mistake is human, and to forgive such a mistake too is human, to suffer in silence and sorrow is both unjust and inhuman. It is the biggest hurdle to inner peace and joy. So, don’t confuse being compassionate and being firm. They need not be exclusive. Simply, no matter who it is, don’t let anyone take you for granted, trample upon your self-esteem, piss on you and pass you over. Remember: if you don’t stand up for yourself – chances are, perhaps, nobody else will! How I am learning to live happily, peacefully, in a WhatsApp Group-ridden world! If we can overcome the urge to want to make a point and to be seen as being right, every single time, we will have learnt the art of intelligent living. PS: Even if you like this status, please don’t forward it…:) 🙂 :)!!! It was posted half in jest. And half out of concern. I am part of very few WhatsApp Groups. Out of these, a majority are well-regulated, non-spamming Groups. Some are virulently spamming and so, I ignore the spam in them and scoop out only relevant messages. In one Group that I am part of, the Admins are making a valiant effort to invite people to pause and reflect before they spam. They are encouraging self-regulation and sensitivity rather than enforcing discipline with non-negotiable rules. It is in watching their struggle that I was inspired to write this Prayer yesterday and this blogpost today. Over a drink last night, I thought through deeply about what we can learn about human behavior and about ourselves while being part of WhatsApp Groups – spamming, non-spamming, whatever kind! I personally don’t read forwards, jokes and spam memes (including festival wishes). I don’t believe in anything that’s not personal. If it lacks a personal touch – including stuff that comes over email/bccs) – it gets trashed by me instantaneously. In fact, my WhatsApp Status message reads thus: “Please don’t send me Jokes and Forwards. Appreciate your kindness. :)” A huge majority of my contacts respect this choice of mine. And I deeply value their sensitivity. But, of course, I realize that not everyone is the same. Fundamentally, we human beings are very expressive. Introverted is a word that does not really apply to us. Seriously. Even the most “introverted” person is expressing himself or herself through their silence. Silence is a great way to say something – several things in fact! So, because we are expressive, and because not all of us are very powerful conversationalists, over phone or face to face, a platform such as WhatsApp gives us so much space, and opportunity, to say whatever we want to. Sometimes, we may have nothing to say, but WhatsApp is seductive enough to entice us to want to make a statement. A Forward, which has no connection with either the subject being discussed or the core intention of a WhatsApp Group, is someone’s way of seizing the opportunity to make that statement. A meaningless festival meme or joke being forwarded is the person’s way of hollering in the deep, black, endless, digital hole: “Hellooooooow! See, I Forward, Therefore I Am!” Further WhatsApp – more than Facebook – because it is at this time hugely text/image driven and smartphone-based, allows instant gratification on several fronts: you can express yourself by forwarding, you can speak your mind on social, economic, cultural, political and religious issues, you can berate someone, you can take on anyone, argue, debate, and fire your salvos (often your dormant emotions, feelings, opinions a.k.a your dil ki bhadaas) head-on. In a face-to-face debate, a better communicator can win an argument. But on WhatsApp, you can drown someone and their argument with your ability to type faster and, interestingly, purge endlessly. If you observe closely, a pattern you will often find in your Groups is that very combative stances taken on issues by people are purely a function of what they think of you as an individual and has nothing to do with their being objective or issue-based. I chose to exit my school WhatsApp Group for the same reason – people who believed Vaani and I were faking a bankruptcy kept attacking every post of mine, while others watched in ‘dignified’ silence. Initially, I didn’t see the pattern. But when I saw it, I exited because I didn’t want the camaraderie in a school buddies forum to be vitiated by a few people’s opinions of one individual and his Life! So, in summary, WhatsApp to a majority of people is not just a messaging platform. It is the virtual version of the Speakers’ Corner in London’s Hyde Park. At least in London, the police intervene when there is a complaint. In a WhatsApp Group, unless the Admins are strict, who is to regulate? And, seriously, no Admin wants more administration responsibilities on their Life’s plate – which is overflowing from so much to do already! So, how do we live, survive, converse and, if you like, share, in a WhatsApp Group-ridden world? #1. To not be in a WhatsApp Group is a personal choice, so exercise it. In essence, this is a leadership moment – decide! #2. If you choose to stay (if you are being forced to stay, revisit #1), please be sure to stop complaining. Complaining never made anything better. It only makes you bitter. #3. If you are on a WhatsApp Group that’s stuffed with folks who are Forward Terrorists, you can learn to ignore their posts. Ignoring is an art. Not everything in Life is relevant or requires your attention and focus. And these folks are giving you a great opportunity every single day to learn the art of ignoring all that is not relevant. #4. Related to #3 are two other arts – the art of not having an opinion and/or the art of not having to share an opinion. The human mind rushes you to want you to have a say in everything. You need not opinionate on everything and in some contexts, even if you have an opinion, it is pointless to voice it. So, simply, learning these two arts, helps you practice patience. A very, very, very important Life skill. #5. Finally, if someone’s being rude, combative, unnecessarily argumentative, then don’t react. Just be silent. The best way to win any battle is to not fight at all. That’s an art too – and WhatsApp gives you just the right opportunity daily to forgive, forget and move on. 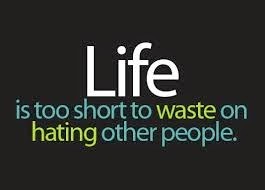 And this is the way I believe I can live happily, peacefully, in a WhatsApp Group-ridden world! Author AVIS ViswanathanPosted on September 24, 2016 September 24, 2016 Categories Forgiveness, Inner Peace, Intelligent Living Inner Peace, Just Be, Patience, Uncategorized, WhatsAppTags Amar Prem, Anand Bakshi, Anger, Art of Living, AVIS Viswanathan, Bankruptcy, bcc, Bhagavad Gita, Buddha, Compassion, Dil Ki Bhadaas, Fall Like A Rose Petal, Forgiveness, Happiness, Happiness Curator, Inner Peace, Intelligent Living, Kuch Toh Log Kahenge, Let Go, Life Coach, Living in the Now, Move On, Osho, Pain, R D Burman, Rajesh Khanna, Shakti Samanta, Sharmila Tagore, Speakers Corner Hyde Park London, Spirituality, Suffering, Surviving in a WhatsApp Group-ridden world, Unhappiness, Vaani, WhatsApp, ZenLeave a comment on How I am learning to live happily, peacefully, in a WhatsApp Group-ridden world! By letting go of your hurt, transform it into forgiveness! Bollywood actor Tabu’s new movie Fitoor (Abhishek Kapoor) is releasing this week. She apparently plays a bitter, vengeful character. The New Indian Express’ Anita Britto asked Tabu, as part of a pre-release interview, if, in real Life, she was as vindictive as her onscreen character. “When hurt and deeply betrayed, only revenge can give you happiness. The great concept of forgiveness is not easy. It is great if you can forgive, but you are in a place to forgive only when you don’t feel hurt,” replied Tabu. While I don’t agree that revenge can give anyone happiness, I do believe that forgiveness happens when there is no hurt. It is important to understand why you feel hurt when someone lets you down or causes you pain, injury and grief. Of course any form of pain – physical or emotional – will hurt. But a hurt festers in you because you allow it to. The truth is that you hurt only when you allow someone’s action to stay with you, in your thoughts. When you let go of your anger, of your suffering, while the source (or impact) of pain – as a person or event – may remain, you will not hurt anymore. You can reach this level of evolution if you understand the futility of hurting and being vengeful. What is the point with either? Someone has wronged you. And they have done it only because they saw it as right. Your getting even with them will only make you suffer more. It is not going to make them any better or realize that they have wronged you. Instead, they are going to retaliate. And then the process of vengeance is will go on and on, never ending. Osho used to tell a story that so beautifully illustrated the need to replace hatred and vengeance with love and forgiveness. One of the greatest Sufi mystics was Rabiya al-Adabiya, a woman who was known for her very eccentric behavior. But in all her eccentric behavior there was a great insight. Once, another Sufi mystic, Hasan, was staying with Rabiya. Because he was going to stay with Rabiya, he had not brought his own copy of the holy Koran. He thought he could borrow Rabiya’s holy Koran. In the morning he asked Rabiya for the holy Koranand she gave him her copy. He could not believe his eyes when he opened the Koran. He saw something which no Muslim could accept: in many places Rabiya had corrected it. It is the greatest sin as far as Islam is concerned; the Koranis the word of God according to them. How can you change it? How can you even think that you can make God’s teaching better? Not only had she changed it, she had even cut out a few words, a few lines – she had removed them. I have not read the Koran. I am not even sure if this story is true. But I believe that its essence is unputdownable. The story reminds us to replace hurt and hatred with love. For ourselves and for those that let us down. You carry a hurt as long as you think about the person that caused it as someone who has wronged you. Instead think of that someone as one who is lost in Life. Who knows not what he or she is doing. And then watch your anger, your hurt, transform into something beautiful and liberating – forgiveness! POPO: Pissed On and Passed Over! But here’s a different take. When POPO-ed don’t do the normal. Don’t grieve. Don’t sulk. Don’t give up on the individual. Instead keep giving your 100 %. Grieving, sulking, bad-mouthing and cold-shouldering are acts of cowardice. Fight the injustice but with love, with mindfulness, by serving. In fact, whatever happens in Life, happens because it was meant to be so. If someone got promoted, that person perhaps deserved it. But in your eyes, you deserved it more. Instead of saying ‘hey, this is unfair’ respond with ‘how could I have served better so that I could have got it.’ This whole idea of deserving must be preceded by serving. Serve to deserve. And even then if you don’t get what you think was truly yours, live in the acceptance of that verdict. This is what will help you retain your sanity, stay anchored and keep moving on. When we get caught in the cesspool of negative energy, resentment, anger and vengefulness, we are hurting ourselves. We must be selfish here. If someone pissed on you, trampled on you, let you down, they did it because they wanted to hurt you. And you will be, by being angry with them, by carrying vengeance and hatred in your heart, allowing them to succeed. If someone overlooked you and gave another what must have truly come to you__a job, a raise, a promotion, a gift, a compliment, a reward, whatever__understand that this person may either want to hurt you or must have a different point of view. By burning within, you are helping this person get what she wants. By reacting without understanding her point of view, you are being judgmental. So, the most selfish, the most blissful response to being POPO-ed is to be selfless and give the situation love, all your attention and magnanimity, to keep doing what you would have done if the situation did not exist. This is your way to inner peace. Now, many times, people tell me, “But I am not Saint or a Mahatma? I am not evolved. I am just human.” Please know that Gandhi was also an unevolved, hurting human and he died only because he was human. To be evolved you don’t need to be a Saint. And being a Saint does not mean you are meek. A Saint, a true Saint, is a warrior of a different kind. Someone who has conquered the demons within. Someone who knows that it is but natural for Life and people to be unfair, that being POPO-ed is but a dimension of Life, a phase that we have to live with. Not with suffering. But with peace. This doesn’t mean that the peaceful should not fight the injustice. But fight it differently. First don’t hurt. Next, return love for hatred and respect for contempt. Third, if there has truly been a case of injustice, choose a form of protest which rises above the ordinary and refuse to yield to the injustice by giving the situation 100 % of everything. These are not contradictory approaches. They are complementary. When you are peaceful, you will be able to fight meaningfully and successfully. So when POPO-ed, be mindful and loving, don’t be sulking!